Saturday- What a busy day! We started with walking the dogs. From there, we took our bikes and rode around the park, as it was the patio sales. Bob bought a pair of shorts $2, I bought a top 50 cents, we picked up a cloth for when I shave Bob’s hair and a free church key, as Bob had lost the last one. We stopped in at the Craft Fair. I was really limping at this time, but I wanted to see everything. We walked around the Activity Center, visiting the Quilt room, the Ceramics room, the Woodworking shop, the lapidary, and the music room. All were open and people were promoting their sales and the various areas. We returned to the rig, and Bob washed the rig. He had done one side yesterday, and the other side today. I started with packing some stuff into the shed and taking the cushions off the chairs at the table. They were hard to get off, as it had rained and dried several times and so they were really tied very tight. Bob loaded the bikes onto the back of the rig, locked them, and put the cover over them. We are taking them with us this year, as we anticipate using them this summer. Koda’s paperwork had arrived yesterday, and we had dropped it off at the vets. Forgot to put that into last week’s blog. We left and went south to Metro Center, stopping at In N Out Burger for lunch. We went to the Dillard’s Clearance Center. I can see why the stuff was on clearance. Most of it was made of poor quality, was ugly, or odd sizes. I tried on a few items, but did not purchase anything. Bob found a Caribbean theme shirt, which we had been looking for, as we have Hawaiian themed events. So he purchased that for $18. We returned, stopping to wash the car, pick up items at Fry’s and Target. We returned home, packed, did a few more tasks, and took the dogs to the dog park. Koda is doing better, she ran on her own. Roxie ran a bit, and Karlie just wandered around sniffing. Koda is getting less tense in the car, and there was hardly any panting today. She really enjoyed some kids who were there and running with the other dogs. We decided to go to Texas Roadhouse for dinner. I texted Linda and we all went. They drove. We had a nice dinner. We had ordered the dog food for the other lady who has been giving Linda food to feed Karlie. So we had given them that, as well as some to feed Karlie and other dogs. I had ordered 2 bags of the food, along with some canned food for Koda. Our order arrived from Chewy in about 24 hours. They are very prompt! Sunday- We did our usual tasks, including this week washing all of the bedding since we have nice large washers and dryers in the park. It was a busy day, getting ready to leave. Bob had to put away our flag, the sign, and other items. We sat outside with the dogs on the patio in the afternoon. Finally, around 5:15, we moved the dogs inside, to their dismay, and packed up the fence. Bob wrapped strapping around sets of 6 panels. We took three of them, so we have 18 panels for Michigan. We left 4 panels in the shed. Our AZ lounge chairs and one old folding chair went into the shed. Finally, on top of everything, we placed the table chair cushions. We could have still put more in the shed, but that was all we had! LOL. We ate dinner at home and I did some tasks around the rig on the inside. I had been working on laundry all day, so that the hamper would only have the clothes we are wearing. Monday- On the road again!! We drove out of Paradise at about 9:30. We took Union Hills east to the 101. Then I-101 south to east bound I-10. We had to exit at 59th street, instead, of 51st street, due to construction. We turned left on Van Dorn, and went east to 51st street. We turned south and traveled thru the Gila Indian Reservation out to I-10. Using this route, means we miss a lot of I-10 in Phoenix and the dangerous “Durango Curve” . Unfortunately, the road was pretty bumpy, for awhile. This is Koda’s first trip in the rig, but she did really well. We always seat belt our dogs. We had put Karlie and Roxie in my recliner and Koda in Bob’s. After the road became smoother, she settled down. At one point, she made a lot of noise, so Bob checked on her and found that she had tangled her hook-up. Once he untangled her she settled right down. No panting! We stopped at the rest area and walked the dogs. We switched drivers and continued to the Pilot in Tucson. We unhooked the car and backed into a site between the trucks. We walked the dogs, then took off in the car to our favorite Mexican restaurant, El Charro, in downtown Tucson. It was after 1 at this point, so we easily found a parking place at a meter across the street from the restaurant. We were immediately taken to our table. Bob ordered his tamale and I ordered the Chile Relleno. We were served quickly. We had put 40 minutes on the meter, and only used 25 When we left the restaurant, we saw that the parking enforcement was busy ticketing cars. We were glad we had leftover time! We returned east on I-10 to the rig, walked the dogs again, and drove on to Benson. Bob drove the rig and I drove the car, since it was only 34 more miles. We had put the dogs in the car with me. As we were driving along, Koda panted a bit, then stopped. I noticed that Karlie was in the sun, so I radioed Bob and told him I was going to pull over and put the screen up, blocking the sun on Karlie. I pulled off at one of the exits, put the screen up, and continued east. Koda started panting again. So I started singing along with Nancy Sinatra, Those Boots are made for walking…. It must have relaxed Koda, as she settled down. The speed limit was 75, and Bob was going 63, so I caught up with him. We drove into Benson, and into Butterfield RV Park and Observatory. We had a reservation, and had paid half. So I went in and paid the second half. I asked the gal about the observatory and she said that the tours were full for tonight and tomorrow night. I started begging, explaining that was the reason we were here and we only needed one person to join the tour. The gal said she would check on it and let us know. We pulled into site 75, and set up. We walked the dogs. This was a beautiful park. We paid $37.93 a night, which included a 15% Passport America discount. 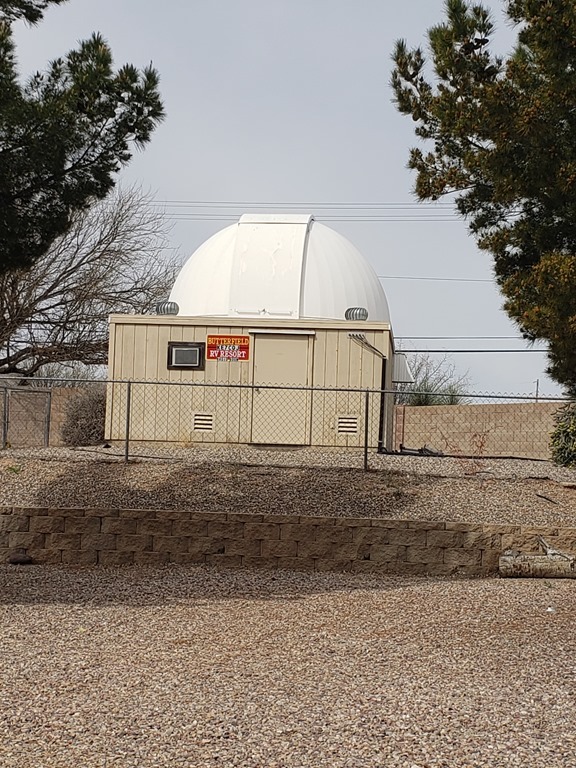 That also included a free tour of the observatory. After about an hour, the gal called and said they had a cancellation for this evening and Bob could join the tour. She said that she would have the maintenance guy drop off the information. After about another hour, he showed up with the form. The form instructed Bob to arrive at 7:30 and to dress warmly, because when the roof opens, it will get cold in the room. Also, no late arrivals are admitted, since that means that there would be light in the room. I stayed home and watched a recorded Hallmark movie. We have excellent WIFI here which is nice. Bob said there were only 15 people in the tour. The usual tour is 18 folks. Tuesday- Because my heel is really sore, post steroid injection, and I am afraid that I am going to not be able to walk the tour of Carlsbad Caverns. So we decided to re-route. We decided to stop in Demining NM at the Escapees Dream Catcher RV Park. So I called and made a reservation for 2 nights. From there, we will continue on to El Paso TX, then Ft. Stockton TX, before our final stop in Fredericksburg TX for the rally. 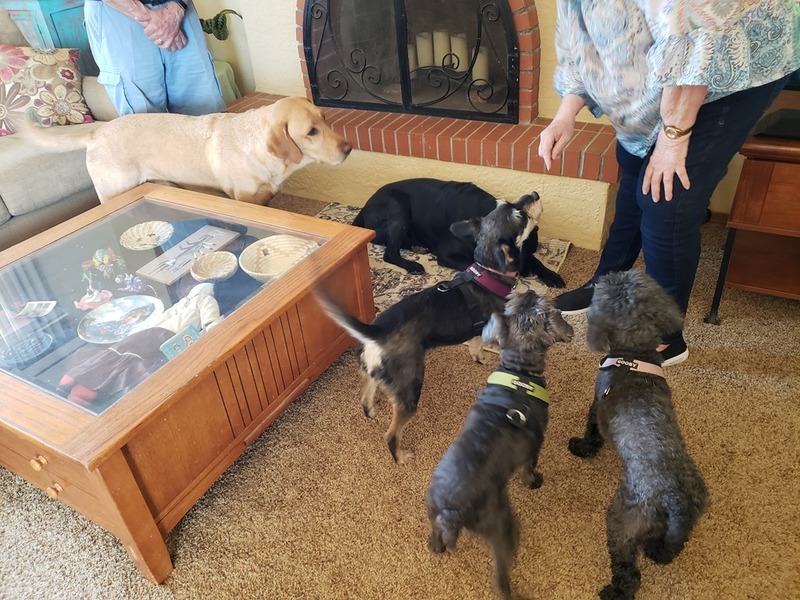 We left a little bit after 10, taking the dogs with us, to visit with Bob’s cousin Ronda, in Sierra Vista. We arrived and introduced all the dogs to Whisky and Bud Light, their two very large Labs. They all got along well. Brian came home, and we decided to go to the German Restaurant for lunch. So we left all the dogs in the back yard. They had water and shade, so they were okay. They all stood at the door looking pitiful when we left. We rode with Ronda to the restaurant . Brian took his truck, as he was working and had a lot to do. He owns his own business, a salvage yard, but is working on selling the metal scrap. We had an excellent lunch, and thank you to Ronda and Brian, for paying for our lunch. We returned to house with Ronda to find that the dogs were all fine. We let them into the house and they all drank a lot of water. When we had arrived, they were all laying in the shade. We sat talking most of the afternoon. At one point, Whisky decided to hump each of the girls. They all told him in no uncertain terms that they were not interested. He was a gentleman and took the “no’s" in stride and they all napped. Ours on the couch, on our laps and the boys on the floor. We wanted to get a picture of them all together, so Ronda took some treats and they all lined up! We left around 4 and returned to the rig. We had leftovers for dinner. We were really glad that Bob had the chance last night to visit the observatory, as tonight it was cloudy and the tour would have been cancelled. Wednesday- We worked on more reservations. We are only traveling 170 miles, so we were not in a hurry. We packed up and left the resort at 10:40( check out was 11). We drove east on I-10. The road was really bumpy. Come on Congress and Arizona, fix the roads!! We had hoped that New Mexico would be better, but if anything, it was worse. Koda did great, she laid down in the chair. She may have even slept a bit. We stopped for lunch at a rest area, then continued on to Deming. We are staying at the Escapees Dream Catcher RV park. We pulled into the park, which is right off the interstate. We had changed time zones, so we arrived around 2:30. Bob disconnected the car while I went in and registered and paid. I had to show our Escapees membership card. We paid $25 per night for FHU 50 amp. There is not much here. It is a gravel lot. No picnic table or any amenities, except for the club house. They do have a laundry and a nice large dog run. There was a social at 4 PM, so we took Bob’s beer and my Mike’s Light Hard Lemonade and went over to the Activity Center. We stayed from 4 to 5. I also checked the Library for any books to trade( none either of us wanted). This evening they also have a Jam Session. at 6:30. We returned and ate dinner. Then we went to Walmart for a few items. We returned and settled in to watch some TV. We were both tired. Thursday- We were slow getting moving this morning, so I ended up taking all 3 dogs out, as Bob was still getting ready and they wanted to go out, at 8:30. We ate breakfast then we walked the dogs down to the dog park. I worked on the blog . When we had put down the jacks to level us yesterday, one of them made a funny noise, so Bob put the rig up and checked it. He could not find anything wrong with it. We left and went to a restaurant called The Patio for lunch. I had a nice salad and Bob had a Rubin Burger. 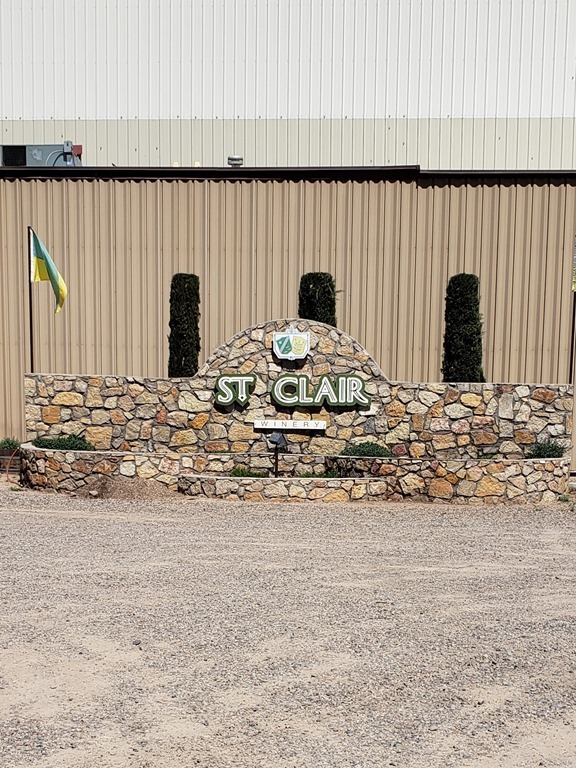 We went to St. Clair Winery, on the recommendation of the people at the social last evening. One of the gals said she only liked sweet wines and that they had sweet wines. The gal there was awesome. I told her I liked sweet wines. ( They have dry, semi-sweet and sweet.) On the park map, there was a coupon for a free flight of 6, We gave her the coupon and she pointed out all the sweet wines. She also had me taste them in the correct order. I ended up purchasing two, the St. Claire White and the Pumo Loco. I gave her a very nice tip since was so great with us. We drove downtown to take a look at the mural in the Post Office. Not much to look at and not worth the trip. We returned to the rig and took a short nap. At 4 we went to the social. At 6 we went to the Pot Luck. I had baked some brownies, as there was no dessert on the sign up list. The wind was howling this afternoon and we decided we needed to leave early in the morning to get to our next stop before the winds pick up. Friday- We left at about 9 AM. So far, so good, with light winds. We traveled east on I-10 about 170 miles to El Paso. We stopped at a rest area in Las Cruces. It over looked the city and it was a beautiful view, but it was so cold, we just did a quick dog walk and continued on our way. We passed thru an ICE roadblock. I guess they take one look at us, and the Border Agent just waved us on. There was a separate lane for trucks. We stopped at the Flying J for diesel, then continued on to a shopping center were there was a Walmart and a Cabela’s . We parked the rig near the Cabela’s where there was a construction area. We disconnected the car and ran to a McDonald’s for lunch, because the bread was green! We ate a quick lunch, then I drove the car and Bob drove the rig, on I-10 across the city. There was a lot of traffic and lots of construction. At around 1, we drove into Mission RV Park, where we have stayed before. We had an RPI reservation which meant that we paid $22 for a FHU 50 amp pull thru site. We set up, and we left, driving to Best Buy. Our dash radio/CD player kept over heating while listening to our books on CD. It also only holds 1 CD, where as the old one held 5. When Bob purchased this replacement radio, about 4 years ago, they no longer sold radios with 5-6 CD’s. Since this has been an ongoing problem with the CD’s overheating, Bob had installed a small fan behind the radio. That is not working well. So I finally suggested that we go to Best Buy and purchase a CD player, with a USB cord, as the radio has a USB port. The Best Buy was about 4 miles away, and not near any of the I-10 construction, thank goodness! I asked the sales guy for a CD player with a USB port. He showed us some with Blue Ray etc. We explained that it was for the motorhome and not for with a TV. So he suggested a boom box. Okay, that would work, but was not ideal. As we followed him to the boom box, I spotted a little round CD player. What we wanted. It did not have a USB port, but it had a headset, and a headset connector . Bob said that would work as we had that kind of port, under the USB port on our radio. So we bought it, plus a longer cord, paying about 24 dollars. Of course, it only plays one CD at a time, but we can deal with that. We settled in, ate dinner, and watched TV. The wind was howling all afternoon and evening.